Sharon, your latest book, ELEPHANT DAWN, suggests that unethical practices – such as the ripping of young elephants from their families – added to the reasons why you left your elephant work in Zimbabwe. Can you share with us some specific concerns about the current elephant captures? PINCOTT: Â Any elephant specialist will tell you that some of the elephants that were photographed from the latest round of captures in Hwange were very young when first captured and placed in bomas awaiting export; some with tusk eruption that confirms they would only have been around 2.5 years old. In the wild, an elephant suckles from its mother right up until the birth of the next offspring, and elephants give birth only 3.5 – 4 years on average (based on my own 13 years of in-depth monitoring). This means that some of these elephants will have been deprived of the goodness of their motherâ€™s milk (or a suitable replacement) for 12 months or more of their young lives. I can only imagine what that will have done to their long-term health. On top of that, these young elephants have once again been left in small bomas for months, with no possibility of proper exercise. Zimbabwe is legally allowed to capture and export these elephants, is that correct? 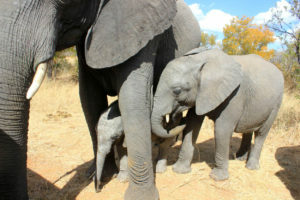 PINCOTT:Â What Zimbabwe is doing might be legal under current CITES (the Convention on International Trade in Endangered Species) laws but it is in no way ethical – especially given all that we know today about elephant families; their deep family bonds; their indisputable level of intelligence; the way they grieve. The young age of some of these elephants when first captured has been an issue too, with every capture that has been done over the past 2 years in Hwange. What are concerned world citizens doing to voice their concerns and outrage about these ongoing captures? PINCOTT:Â There have been various specialist groups, both within Africa and around the world, working for years to push for all elephants to be listed on CITES Appendix 1 â€“ which would then make trade such as this much more difficult. There has also been endless pressure on zoos to act responsibly and for CITES to apply stricter rules and regulations. There have also been countless pleas for Zimbabwe to act responsibly and with compassion for their natural heritage. These efforts have not yet proved successful, but these groups have certainly not given up. In the meantime, however, young elephant captures continue in Zimbabwe; the only country currently ripping young elephants from their mothers. The Environment Ministry and the Parks Authority appear to have publicly lied about where these captured elephants are headed. Does this surprise you? PINCOTT:Â Nothing in Zimbabwe surprises me anymore. But nothing can deflect from the fact that what they are doing in Hwange is highly unethical. And this applies whether captured (intentionally orphaned) elephants like these end up in zoos, or in other parts of the country/continent. Zimbabweâ€™s wildlife officials are becoming renowned for intentionally misleading the public and trying to confuse situations, with stories changing frequently. You donâ€™t do that unless youâ€™ve got something to hide. In your opinion, what does Zimbabwe need to do now? PINCOTT:Â Based on literally hundreds of messages that Iâ€™ve received since leaving Zimbabwe in late-2014 and the release of ELEPHANT DAWN (the story of my 13 years with elephants in Hwange) this year, itâ€™s very clear to me that Zimbabwe is losing tourist interest and enthusiasm every single day that these young elephant captures continue. Photographic tourists these days demand an ethical, honest and happy experience, otherwise many simply decide to take their tourism dollars elsewhere. Despite everything, photographic tourism is one of Zimbabweâ€™s biggest income generators. So why are ZimParks so broke? And why are the communities surrounding the national parks â€“ including Hwange National Park – where much of this tourism income is generated, so poor? Selling off young elephants to cover discrepancies that need fixing in other areas isnâ€™t the answer. On top of everything, the trauma involved all round â€“ for the individual young elephants, for their elephant families, and for the distressed photographic tourists who decide to visit elsewhere â€“ simply isnâ€™t worth it. Zimbabwe needs to urgently rethink its capture policies. Evil evil evil. Zimbabwe has zero morals, selling elephants to a life of sadness.